The name Indonesia was derived from "indos nesos", meaning islands near India, The country is in fact the largest archipelago in the world with thousands of islands, 17,508 to be precise, spread in an area between the Asian continent and Australia, and between the Pacific and the Indian oceans. The islands are inhabited by hundreds of tribes and thousands of sub-tribes with diverse cultures and languages. There is a national language spoken throughout the country, namely Bahasa Indonesia. It is thus appro - priate, that the country's motto is Bhinneka Tunggal Ika, which means: Unity in Diversity. 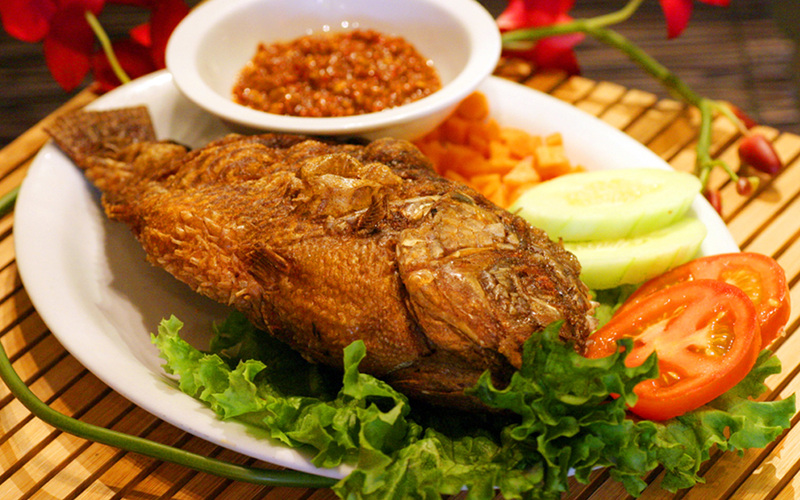 Indo Cafe marries traditional authentic Indonesian cuisine with modern innovation and presentation. At Indo Cafe, we strive to bring you the diversity of our dishes so that our customers can appreciate the vast selections of food from different parts of Indonesia. 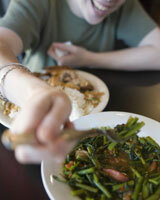 Come and discover the taste of Indonesia at Indo Cafe! It's hard to believe that a city the size of Seattle has only one of anything. Sure, there's only one Space Needle, but this is a town with a dozen Fortune 500 companies and four major-league sports teams. There are four map stores in Seattle. There are three Shakespeare companies. And yet, somehow, there is only one Indonesian restaurant: the Indo Cafe, nestled in the back of a cheesy little strip of stores just a block from Northgate Mall. Indonesia's a funny little country, made up of over 14,000 small islands—a loosely affiliated republic whose cuisine is almost as fragmented as its geography. To specify an Indonesian cuisine is problematic—most of the islands can agree on the use of fish, coconut, and chilies, but regional cuisines run the gamut: There's a strong Thai influence in the north, and centuries of Dutch colonization and decades of Japanese occupation have both left their culinary marks. The menu at Indo Cafe reflects this culinary diversity, celebrating it through a widely varied series of dishes that share only the sense that they were all conceived by the seaside, under a hot tropical sun. I wonder if dishes like "Monte Cristo sandwich" and "steak and eggs" sound as funny in Indonesian as "empek-empek palembang" sounds in English. Thankfully, the menu included lots of pictures, and the Indonesian wait staff—we had three servers working with us throughout the night—was earnest, helpful, and honest, steering us away from dishes they thought we might not like, or dishes that were inappropriate for dinner, or dishes that would be difficult to share. When we told one of our waiters that it was our first visit to the cafe (and, in fact, our first visit to an Indonesian restaurant) he put his hand over his heart, and sincerely told us how excited and honored he was to introduce us to his cuisine. We started the meal with the risoles ($4.95), a lightly breaded pair of Dutch-inspired egg-roll pockets stuffed with a slightly sweet chicken ragout. They were light and delicate, served with a plum sauce that heightened the sweetness already present in the meat. There were unusual flavor harmonies working in the risoles, tastes that had my guest and I looking at each other with a "Wow, what's in that" expression. The siomay campur bandung ($5.95) was just as intriguing as we attempted to dissect it down to its components in our mouths. There was a fish ball, lightly spiced and wrapped in some sort of won ton skin, and a chunk of tofu stuffed with ground chicken, most interesting for its use of tofu not as a meat substitute but as a textural ingredient to be used in concert with various meats. Slathered over everything is Indo's house-made peanut sauce, light and sweet (if a little straightforward and characterless). The empek-empek palembang ($6.95) was pretty much completely foreign to our Western palettes—a fish cake with a chewy, almost rubbery texture (think red-snapper-flavored Starburst) served with a sinus-clearing hot sauce and noodles. While we didn't finish this dish (to be honest, we ordered it for the name), it did add to the culinary portrait of life by the sun-drenched beaches of the islands. With the entrées, my guest and I ventured deeper into the proteins on the menu, exploring the rendang sapi ($8.95) and the bakmi goreng jawa ($7.95). The rendang (sirloin tips cooked in coconut milk and served with long-grain polished Indonesian rice) was perfectly spiced with a rich blend of sharply peppery notes, sweet clove and nutmeg, and other unknown but earthy flavors. Unfortunately the meat itself was overcooked almost to inedibility; we found ourselves licking the dry rub off the chunks of sirloin and leaving the meat itself on the plate. The bakmi (chunks of pork mixed into Javanese-style noodles) suffered a similar problem. While the noodles and spicing were both dead-on, the chunks of pork were far from the mark—we ate around them to explore the noodles without having to deal with the slightly funky (and unidentifiable) pork products. There's an intriguing dessert menu that begs to be explored (full of fruits, gelatins, and something called "black grass jelly" for $2.95) and a surprisingly deep beer and wine selection (for a strip-mall restaurant, anyway). Follow one simple rule at Indo Cafe and you'll be fine: Order it only if you can picture finding it on the beach of an equatorial island in Southeast Asia. No cows. No pigs. No sheep. Lots of fish. Lots of fruit. A little chicken. And a little black grass jelly. 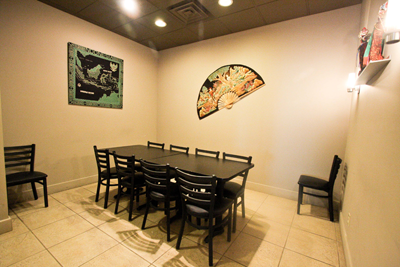 Our smallest private room can fit up to 10 people. 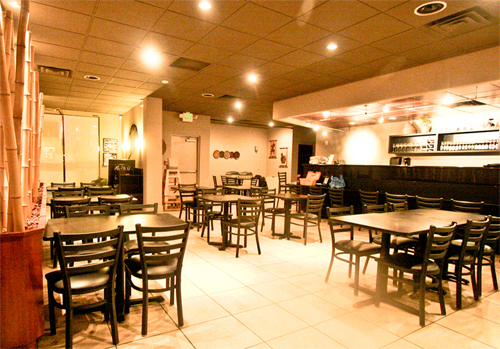 It is private and it's perfect for business meetings or group meetings. 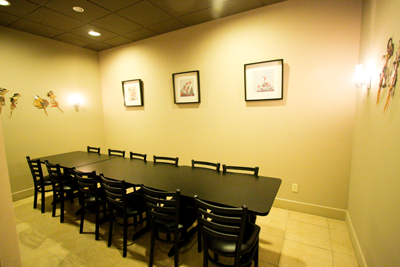 Our second biggest private room can fit up to 14 people. It is private and it's perfect for bachelor and bachelorette party. 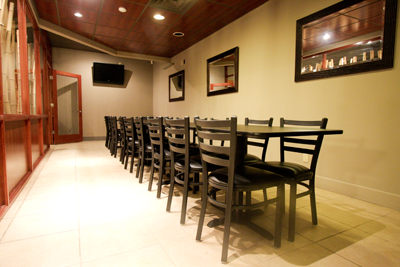 Our biggest private room can fit up to 25 people. This room is equipped with a flat-screen TV, HDMI cable, perfect for your business presentations or even personal parties such as birthdays, graduations and company parties.